I’ve always found that making lists makes me much more productive, because I can actually visualize what I’m accomplishing as I cross each item off my list. As you can see, this was a highly productive weekend. A word of caution: if you watch the entire first season of Dexter - the show about a serial killer with a moral compass – in one weekend, you will have bad dreams. A lot of bad dreams. Dreams about serial killers, and pools of blood, and scalpels, and body parts, and meeting serial killers, and being a serial killer, and thinking serial killers are really hot. Consider yourself warned. I must admit to being surprised that “getting dressed” was so low on the list. I’d think at the very least it would come before grocery shopping. But not before washing dishes. That’s the absolute best way to wash dishes! I started watching the first season of Dexter this week on a date! I love him! Maybe that’s what we’ll do for v-day? Sweetie, at least remember to feed the cats. You don’t want carcasses to clean up. dave2: clothes are highly overrated. plus my list-making mind doesn’t work in chronological order. pants: nothing more romantic than watching a serial killer show with your date! jodi: thanks so much! but i hope you’re not too attached to those cat names… they change about every 2-3 months. rhea: so true. but as we’ve learned, my cats have a few extra pounds to spare, so i probably did them a favor. So then, how do we explain my bad dream last night involving a friend from college becoming a hit man trying to kill my kids’ coaches? I’ve never even SEEN Dexter. Are you channeling your bad dreams and sending them to me? STOP IT! The cats may eat you if you do not feed them. Serial killers tend to be highly organized with an impeccable attention to detail, so maybe you could just hire one to come in once a month and help you mop the kitchen floor, do your laundry, and help you brush your teeth. I would imagine they’re very reasonable where pricing is concerned, as well. 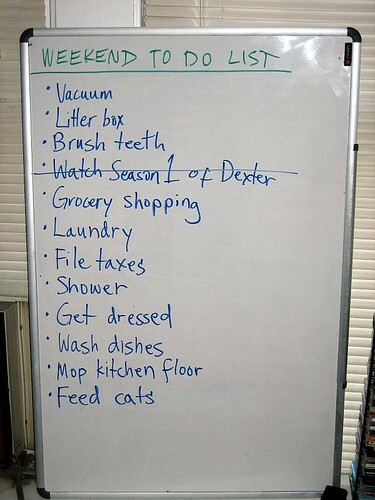 I’m glad to see I’m not the only one with “vacuum litter box” on the top of their to-do list. I mean, do people ever use that scooper thing anymore? Ghah. shari: sorry, i’ll try to send you some of the more… entertaining ones next time. robin: i did notice some suspicious teeth-like marks on my ankle the other day. sir: that would really be a dream come true – my own personal serial killer/housekeeper! what more could a girl ask for? roy: maybe i should just vacuum my teeth as well. That white board never ceases to amaze me. Ha! This reminds me why I don’t make to-do lists: because simply adding things to it makes me feel like I’ve made great strides towards completing the task, which then makes me decide I deserve a break. I still get goosebumps when I heard the theme music to Unsolved Mysteries. So, that’s it. You’ve sold me. I’m taking a weekend to watch Dexter and making a point not to get dressed. I can’t wait. I have only now started watch Grey’s Anatomy (for lack of Desperate Housewives) and now whenever I’m depressed, I think of Grey’s Anatomy, when I’m busy, I think of Grey’s Anatomy, when I’m tired, I think of Grey’s Anatomy, and when a friend at work asked what I was doing on Valentine’s Day evening, instead of thinking about my lovely boyfriend, I though of Grey’s Anatomy (Patrick Dempsey in particular).